Instant Imprints East Vancouver, BC | Custom T-Shirts, Embroidery, Signs and More! 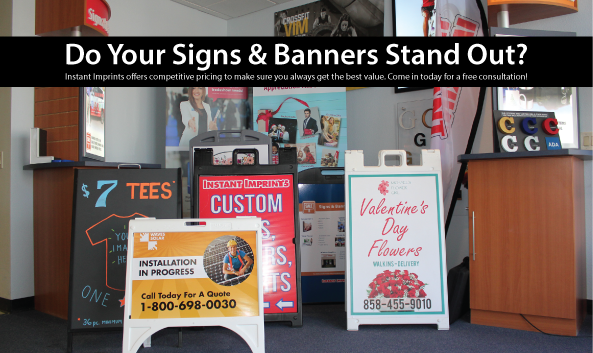 At Instant Imprints Victoria Drive in Vancouver, BC, our customers come to us when they want to be more visible to their customers. We create that visibility five different ways: Branded Apparel (embroidery), Signs & Banners, Promotional Products, Custom T-Shirts and Print Services. I got a tshirt from them it turned out lovely & great looking! And their service is quick and they are very easy to work with . I highly recommend them. Is your business looking to expand its visibility? There’s no better way than branded products! Whether you’re looking for custom t-shirts, printing services, promotional products, custom banners or branded embroidery items, Instant Imprints is your source for superior service. Right here on the eastside of Vancouver, you can find our team of Image Experts ready to help you make the perfect product, from start to finish. You’ll be sure to get your project done right and on time, with a level of professionalism that can’t be beat. Best of all, your project is produced all in-house, under one roof here in Vancouver! When it comes to promoting your brand or a special event, the quality of your print goods can make all the difference. Our professional print shop can provide a level of quality and scalability that home or office printing solutions just can’t match. On top of that, by ensuring that your prints are done right, you avoid the costly revisions that cut-rate print jobs often require. Whether you’re looking for posters, brochures or mailers, come on down to your Instant Imprints in East Vancouver and get your project done right. Custom t-shirts may or may not be your brand’s big break into the fashion arena, but they’re nonetheless fantastic ways to promote your services or an upcoming event. By providing customers and employees with custom tees, you’re letting them be your brand ambassadors, as they promote your business wherever they go. All around BC or across the seven seas, a custom tee can take your brand around the world and back. When you’re ready to take your business to the next level, let Instant Imprints be your promotional product partner. Stop by our showroom on Victoria Drive, give us a call at (604) 620-5626 or request a quote online to get started today!